Across the region, the legitimate struggles of indigenous peoples are being coopted by Western NGOs and media to serve the psychological warfare offensive of the US government and its allies against progressive governments in Latin America. Almost all Western reporting of foreign news constitutes a permanent drip-feed of poisonous disinformation accumulating into a deep, broad, toxic propaganda wave drowning out rational critical analysis. That process has been very clear in reporting of international affairs from Libya to Ukraine, to Venezuela and Syria – anywhere the interests of Western elites encounter resistance. The collaboration of alternative media in that process has been evident in Libya, Syria and Ukraine and is certainly very evident in the case of Nicaragua. Here, the constant underlying false message is that President Ortega is a dictatorial leader crushing dissent in Nicaragua to impose an anti-democratic regime run by his family. This false message creates a context justifying arbitrary measures by the US authorities and their allies, like the recent NICA legislation, attacking Nicaragua’s economy and intervening heavily in the country’s internal affairs in favor of Nicaragua’s right wing opposition. To flesh out that keynote psychological warfare message, Western media attacks focus on whatever current events they can manipulate to align with the overall falsehood. Democracy Now’s editors ran this classic psychological warfare propaganda beneath a photograph supposedly of a rural worker wounded in an allegedly peaceful protest. Democracy Now omits that six police officers were reported to be wounded after being attacked by violent protesters. The summary report also omits that the “activists” are militant anti-Sandinistas of the misnamed MRS Sandinista Renewal Movement, funded by the US and allied governments and associated NGOs. Likewise, the suggestion that 120,000 people may be displaced by the proposed Canal is completely false, the real figure is under 10,000 people, all of whom are entitled to complete indemnification. A flurry of reports in corporate and alternative media alleged that the government of Daniel Ortega tried to repress national protests against the Canal timed to coincide with a visit to Nicaragua’s capital Managua by Luis Almagro, right wing Secretary General of the Organization of American States. In fact, it seems that only the incident in Rio San Juan involved violent exchanges between protesters and the police. The national demonstration itself passed off peacefully, with a modest total of several thousand people demonstrating in Managua’s center against the proposed Canal. The incident in Nicaragua’s south-western Rio San Juan department provoked angry condemnation from the local bishop Socrates René Sándigo, certainly no friend of the Sandinista government. Bishop Sándigo remarked, “The MRS has always been out there manipulating our rural families and non governmental organizations who involve our rural workers in demands that may well be legitimate but they take these rural workers and put them at the head of their attacks...” Given that context, Democracy Now’s headline summary can be seen as all of a piece with its similarly false reporting, for example, of the conflict in Syria, favoring anti-Russian US government propaganda. Much less prestigious than Democracy Now, the Intercontinental Cry web site purports to represent the views and interests of indigenous peoples around the world. But in the case of Nicaragua’s northern Caribbean Coast its reports are written in the worst neocolonial tradition by North American academics and writers with a very clear anti-Sandinista agenda . One of these writers is the PhD anthropologist Courtney Parker whose widely published inaccurate report in July 2016 carefully omitted relevant information inconvenient to her account. International Cry later supplemented Parker’s July report with a disingenous, misleading attack on us at Tortilla con Sal, evading our criticism that they recycle propaganda of the local Yatama political party, effectively covering up Yatama’s own role in the violent events Parker and others fail to report fairly and honestly. To make their phony case against Nicaragua’s Sandinista government, Intercontinental Cry’s reports consistently omit two essential facts. Firstly, Nicaragua’s Sandinista government under Daniel Ortega is the first administration since the revolutionary Sandinista government of the 1980s to guarantee indigenous people’s land rights. As a result, indigenous peoples in Nicaragua now have statutory land rights to a third of Nicaragua’s national territory. So it is completely counterfactual and deceitful of Intercontinental Cry to publish reports implicitly claiming that the Sandinista government deliberately seeks to deprive indigenous peoples of their land. Intercontinental Cry’s reports are based on allegations of Yatama political party supporters whose leadership themselves have faced serious allegations of complicity in the illegal sale of their own peoples’ land. The second fact obscured by Intercontinental Cry’s reports is that Yatama is not the only representative of the region’s Miskito and other indigenous peoples. In 2013, a large group of the region’s Miskito population rejected the Yatama leadership and now support the Myatamaran political movement allied with the Sandinista government. That omission indicates just how skewed and neocolonial Intercontinental Cry’s reporting on Nicaragua really is by creating an inaccurate, image of a united Miskito people, hapless victims of relentless alien oppression. The history of the Miskito people itself shows up that kind of account as a ridiculous neocolonial construct. Reports in Intercontinental Cry seem to deliberately omit the fact that extremist Miskito groups have attacked and murdered rural workers’ families in the area in conflict. Historically, some components of the Miskito people allied with British colonial forces and were themselves cruel oppressors preying on weaker ethnic groups to sell them as slaves to British plantation owners in Jamaica and other British Caribbean colonies. Furthermore, Miskito groups in Jinotega along the Rio Wangki, have a somewhat different history to that of Miskito groups along Nicaragua’s Caribbean Coast. So even in historical terms it is false to suggest that the Miskito indigenous people share a uniformly homogenous history and cultural identity. None of that is reflected in the neocolonial accounts rendered by the writers for Intercontinental Cry. To the contrary, despite the complicated political reality in Nicaragua’s northern Caribbean Coast, Courtney Parker’s July report and Brett Spencer’s November 11th report both falsely suggest that Yatama is the only organization representative of Miskitos in Nicaragua’s northern Caribbean Coast and the only opposition movement to the Frente Sandinista Front for National Liberation. In fact, the right wing Constitutional Liberal Party (PLC) has always had significant support in the interior of the northern Caribbean region area and won a seat in the legislative elections along with Yatama’s caudillo Brooklyn Rivera. The third seat was won by the FSLN. Spencer neglects to mention that Rivera was stripped of his status as a legislator following very serious allegations that he and his Yatama colleagues were illegally selling Miskito land. Spencer turns that reality on its head by alleging that the rural farming families trying to settle Miskito land sold to them illegally are “Sandinista”. Intercontinental Cry have no factual basis at all for publishing that kind of malicious smear which is pure Yatama propaganda diverting attention away from the questionable dealings of their leadership. For her part Courtney Parker published another pro-Yatama propaganda piece exploiting the terrible murder of three members of a family on their isolated farmstead. Parker suggests on the basis of hearsay that the murder was committed by marauding settlers, arbitrarily excluding the possibility of inter-ethnic violence by Yatama extremists or some other sinister interests. Despite Intercontinental Cry’s very clearly biased coverage of the complex conflict in Nicaragua’s northern Caribbean Coast, their team of writers has still managed to co-opt other alternative media so as to broaden the reach of their attacks on Nicaragua’s Sandinista government. Influential progressive Western alternative outlets like Truth Out and the Ecologist published Parker’s flawed reports which break just about every rule of academic rigor and basic reporting. Intercontinental Cry’s editors have finally explicitly acknowledged their anti-Sandinista agenda, overtly attacking Telesur, and openly avowing their sympathy with US and allied government funded Nicaraguan anti-Sandinista NGOs and media like Confidencial and CENIDH. NACLA, Brett Spencer and Laura Hobson Herlihy offer precisely zero evidence for their claims of electoral fraud apart from the claims of Yatama leader Brooklyn Rivera. The apparently authoritiative link by the foreign funded CENIDH human rights outfit leads to a fact-free opinion piece by veteran anti-Sandinista Carlos Tunnerman Bernheim. NACLA’s article alleges inconsistencies in results published in Nicaragua’s official La Gaceta and the Electoral Council’s web site apparently in ignorance of the Electoral Council’s reporting procedures which consists of presenting first preliminary results, then provisional results and, only when all challenges have been processed, the final results. Here are the final results from the Electoral Council’s web site which enables visitors to scrutinize results right down to those of the local voting centres. The Yatama party for which Laura Herlihy Hobson and Brett Spencer propagandize is a regional party which only participates in Nicaragua’s departmental elections for the National Assembly. The results completely contradict Yatama’s claims of electoral fraud. 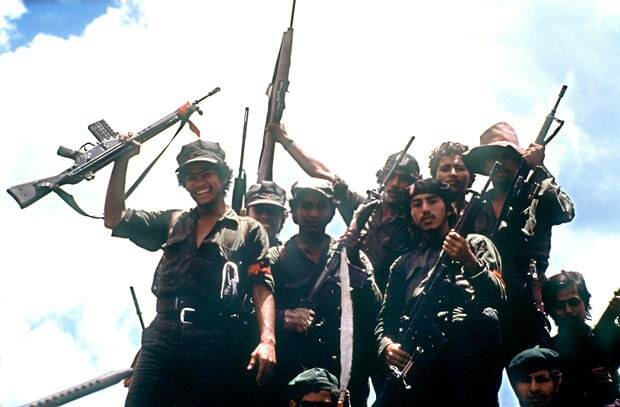 In the three municipalities where indigenous people predominate, Yatama prevailed easily against a strong minority vote in favor of the Sandinista Front for National Liberation. Presidential elections: FSLN 73%; PLC 19%; Other right wing parties 8%. National legislative elections: FSLN 65.86%; PLC 15.3%; Other right wing parties 18.89%. Central American Parliament elections: FSLN 74.3%; PLC 18.86%; Other right wing parties 6.84%. That was the reality of the elections beyond NACLA’s vague, hazy propaganda message and the predictable complaints of Nicaragua’s inept, dishonest political opposition parties, duly parroted by Western media. In fact, the term limits for almost all Nicaragua’s institutions, the Presidency, the National Assembly, the Supreme Court, the Supreme Electoral Council and the Auditor General’s office all remain unchanged at five years. Rather than checking their facts, NACLA and Al Jazeera have lazily recycled the false accusations of Nicaragua’s miniscule centre right social democrat movements who have proved incapable of developing a credible political opposition to Nicaragua’s Sandinista government under Daniel Ortega. By linking to this inaccurate Al Jazeera report, NACLA, Laura Herlihy Hobson and Brett Spencer show up the categorical falsity of their argument. Equally false is their accusation that no foreign observers took part in Nicaragua’s electoral process. In fact, a group of extremely prestigious foreign electoral specialists accompanied the whole process starting in May 2016. Their reportthoroughly vindicated the professionalism and impartiality of Nicaragua’s electoral authorities throughout the electoral process as well as the efficiency and transparency of the elections on November 6th. The neocolonial demand by Western progressives for foreign electoral observers is one not raised in the case of the United States or other Latin American governments like Mexico, Argentina and Uruguay whose example Nicaragua has now followed by excluding a role for interventionist electoral observation missions. Similarly, the accusation that Daniel Ortega effectively ran unopposed is belied by the NACLA report itself and the election results too. Nationally the total opposition vote would have been well over 30% if the right wing parties had overcome their petty internecine divisions, thus enabling a much more effective opposition in the legislature. As has been the case for years now, the weakness of political opposition to the FSLN government in Nicaragua resides in the right wing’s own divisions and their inability to mount a credible political program capable of matching the success of President Ortega’s Sandinista government’s National Development Plan. Turning to the falsehood that President Ortega’s family occupy high governmental positions, the reality is again completely different from NACLA’s mendacious assertion. Four children from Daniel Ortega and Rosario Murillo’s family work in posts associated one way or another with the government. None of them occupy ministerial positions. Rafael Ortega works as a personal assistant to Daniel Ortega. Daniel Edmundo Ortega heads the Sandinista media outlet El 19 Digital. Camila Ortega is a personal assistant to her mother Rosario Murillo. Laureano Ortega is an executive of Nicaragua’s investment promotion authority ProNicaragua. None of them has an executive position at the head of any central government Ministry. NACLA’s accusation is completely false. Laura Herlihy-Hobson and Brett Spencer follow up the falsity of their broad accusations against President Ortega’s Sandinista government by repeating the claims made by Courtney Parker and Spencer in Intercontinental Cry’s series of articles through 2016. They even allege that “settlers have invaded and now illegally occupy half of the Muskitia rainforest region”. The link there is to a New York Times article that offers nothing to support the claim in Herlihy Hobson’s and Spencer’s NACLA article. To the contrary, the New York Times article shows the Nicaraguan government is trying to combat the violent land conflicts in the northern Caribbean Coast but with limited success. Nor does NACLA offer any other support for their article’s false allegation. More clearly than in the Intercontinental Cry series of psy-warfare articles, Laura Herlihy Hobson and Brett Spencer cursorily acknowledge the controversial role of Yatama leader Brooklyn Rivera. But they play down the political opportunism that has marked Rivera’s career ever since his days as a collaborator with the US government funded Contra terrorist campaign in the 1980s. An interesting point from the NACLA article which will certainly figure in similar future psy-warfare attacks is the effort to link the land conflicts in Nicaragua’s northern Caribbean Coast with opposition to the proposed Interoceanic Canal, even though the Canal lies many hundreds of kilometres to the south of Yatama’s strongholds. The NACLA article and its writers studiously avoid noting that the Nicaraguan authorities have already reached agreement with indigenous people’s organizations in the areas likely to be affected by the route of the Canal. But the efforts to connect Yatama to the Canal protests tie in with Democracy Now’s dishonest coverage of the most recent Canal protest, representing a coordinated alternative media agenda similar to that of Western corporate media. That agenda is very clearly one of neocolonial divide and rule, fomenting violence in any countries with a progressive government, not just Nicaragua but in the other Bolivarian Alliance countries like Bolivia, Ecuador and, most notoriously perhaps, Venezuela. NACLA’s and Intercontinental Cry’s blatant propaganda in defense of Yatama’s repeated aggressive violence promotes Yatama’s sectarian political agenda in a self-serving, sensationalist way evidently calculated to maximize the potential for conflict. This is very much in line with the experience of the Ecuadoran government, faced with vicious attacks from the CONAIE indigenous people’s organization or the experience of the Bolivian government faced with murderous attacks by indigenous mining cooperative organizations. Across the region, the legitimate struggles of indigenous peoples are being coopted by Western NGOs and media to serve the psychological warfare offensive of the US government and its allies against progressive governments in Latin America. That is why it is entirely correct to characterize as neocolonial the psychological warfare role of supposedly progressive alternative media that recycle propaganda material like that of Intercontinental Cry.